Time vs. Temperature - What changes what? Speaking mathematically, 200 degrees of heat for 10 minutes should be the same as 400 degrees of heat for 5 minutes , but that's not the case, right? So what's the difference if I cook something for 5 minutes at 450 vs. 350, as opposed to something at 350 for 3 minutes or 7 minutes? Which "dial" (time / temperature) changes the outcome in what way? Why is this? One fundamental error in this question: 400 degrees is not twice as hot as 200 degrees. Temperature is a measure of the kinetic energy of the particles involved. The only scale on which you can do the kind of ratio you are imagining is Kelvins - you have to measure from absolute zero. so the kinetic energy of the air in the oven is only about 477/366 = 1.3 times as high at 400 F as it is at 200. For simple cases, like how long it takes to evaporate a pan of water, 1.3x is probably pretty close to right, but as is pointed out above, there are a whole host of other variables that come into play with real food. Many "things" happen in cooking a particular dish. These physical and chemical (even biological) processes require a certain optimal range of temperature (and humidity) and take a certain amount of time to be completed. For example, when you bake bread, the yeast in the dough remains alive until the temperature rises high enough to kill it. It continues to produce gas as the heat begins to set the dough. The dough should set just as the bubbles are at their largest size for fluffy bread. If gas production peaks before the temperature is high enough, the bubbles can collapse; if the temperature rises too fast, the dough will set too early. If I have a tough piece of meat, I might cook it for 12 hours at a low temperature and high moisture to tenderize it (and maybe in a braising liquid to add flavor). Then I can cook it for two minutes at a very high temperature to brown the surface without raising the overall temperature, so the inside stays rare. In general when dry-cooking meat you often want the inside to reach a certain temperature, without having the outside dry out too much. So it's a balance between two extremes. If you want an internal temperature of 150 to kill bacteria or parasites, you could imagine cooking for 12 hours until the whole piece reaches that temp, but then you lose a lot of moisture. You could turn it up to 500 and hope the inside heats up faster, but by the time the inside is ready, the meat on the outside gets way too hot and maybe even starts to blacken. Somewhere in between you get the interior done properly, with the exterior just a little browned and crispy. If you are cooking seeds like rice or beans, it takes a certain amount of time for the seeds to absorb water and become soft enough to eat, and this happens faster if the temperature is high. While cooking in water you have a maximum temperature limit, at the boiling point. So, cooking instructions are calibrated by trial and error (and educated intuition) to allow the different chemical and physical processes to happen in the conditions that produce best flavor and texture. It is true that there is a negative correlation between cooking time and temperature: the higher the temperature, the shorter the cooking time. But it is highly non-linear. Even if you were to account for the fact that temperature is measured on a ratio, not interval scale where the real zero is at 0 Kelvin, it will still not help you at all. Consider first the easier part of the process: the relationship between the food's internal temperature and the doneness of the food. Cooking food with heat is waiting for certain thermodynamic changes to happen, for example in the case of meat, you wait for the proteins to denature. 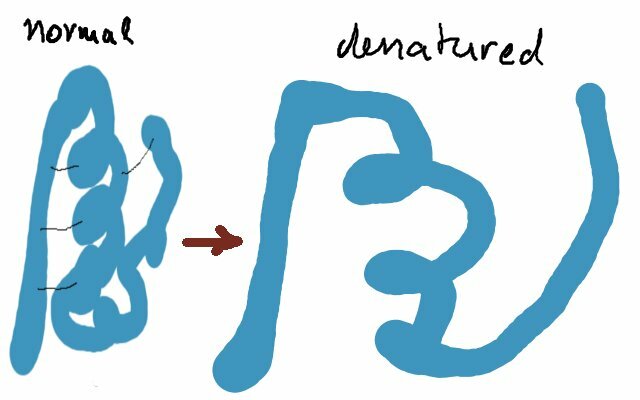 This means that you start with the rather curly protein molecule, and after it having suffered enough brownian movement, it unravels a little bit, losing some of the weaker bonds between atoms. Per the central limit theorem, out of the millions of molecules in your food, the above distribution also tells you what percentage of them will be converted to the cooked state after a second. This explains why, if you heat sugar syrup, you get caramel at a given temperature almost instantly - you have reached the temperature where over 99% of your molecules will convert to the caramelized state after a second - but if you leave sugar for a very long time at lower temperatures, it will also caramelize. This is because after enough seconds of one molecule in ten thousand getting caramelized per second, you get the whole sugar lump caramelized. On the other hand, your room temperature is so low, that maybe only one molecule in a billion will convert in sugar stored at room temp, and you will have to wait for centuries for all of it to caramelize. This is because you are at an almost flat point to the far left of the curve. So, time and internal food temperature are connected in a very non-linear fashion. 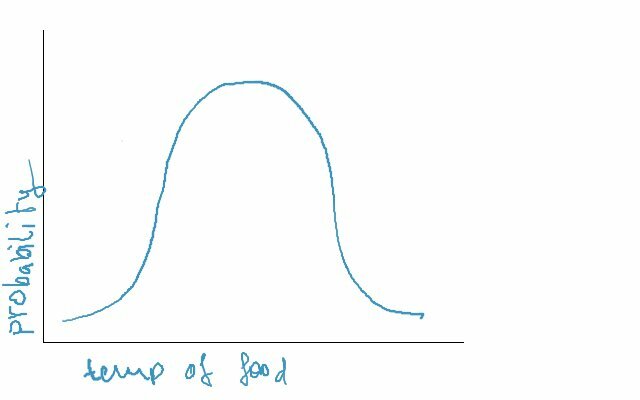 You could theoretically make some predictions, if you knew the mu and sigma parameters of the Gaussian curve; however, they will change with the food item and the process you want to happen. The denaturing of proteins illustrated above is one such process, caramelization is another, but governed by the same general relationship. Most of them are. (An exception would be the melting of cristalline substances like cocoa butter, which have a sharply defined melting point). The actual calculation might go like this: at 56 Celsius, it takes 1 second for a steak to be cooked (techncially, for at least 99% of the myosin on it to get denatured). At 55 Celsius, it might take half minute, at 54 Celsius, 3 minutes, at 50 Celsius, 15 minutes, and so on. 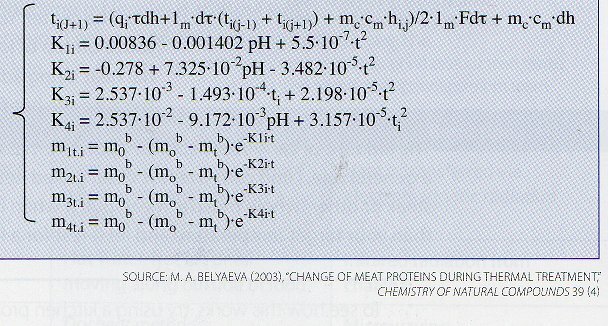 I am using random numbers here, you can find the true numbers for meat if you look around for sous vide curves, I doubt that there are easily accessible sources for other processes such as caramelization or starch gelation. The point is that there is a dependency, but you can't predict it intuitively, because it deviates a lot from a linear one, and most people can only intuitively predict linear connections. But it becomes even more complicated. You can't heat each molecule individually. Let's forget microwaves for a while, they don't help you much, and they don't have temperature settings anyway. What you have is a source of heat, like a stove, oven, or open fire, and you want to transfer heat to the food. The heat is transferred via convection, conduction and radiation to the surface of the food, and spreads into the inside mostly by conduction for solid foods and a combination of convection and conduction for fluids. So, when you have heated the food surface to 100 celsius, the interior is much colder. And how long does it take to heat the inside of the food? Well, this depends mainly on the geometry of your food and its chemical composition. Which explains why recipes which tell you to cook food for a given time per weight (e.g. "roast the meat for 10 minutes per 250 g) are so bad. Depending on what shape your meat is, it will take much longer or shorter than that. Other factors, e.g. dealing with high-quality aged meat with tight cell walls and low water content as opposed to PSE meat with its higher water content will also change the time needed. I don't know what most of these variables mean, and I am happy that I don't have to. And of course, other cooking processes such as caramelization or Maillard (the process which creates crusts) will have a different system of equations, equally complicated. There are sometimes processes in cooking which you don't want to happen. One example is food getting burned. Another typical example is meat. It is composed of, roughly speaking, two types of protein, actin and myosin. They denature at different temperatures - each of them has its own curve, and actin's is shifted to the right. 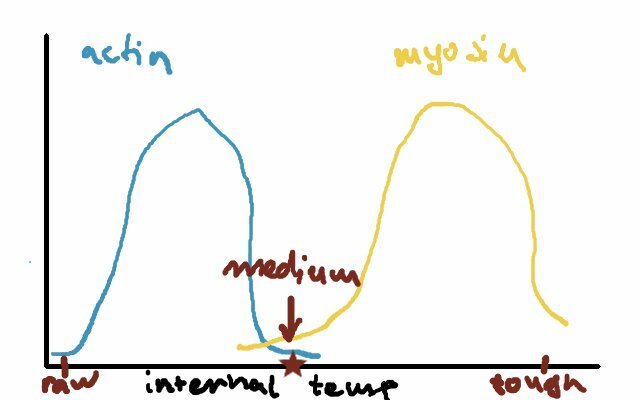 When myosin denatures, the meat is medium, soft and juicy. When the actin denatures too, the meat is well done, or tough and dry. What most people try to achieve is to denature the myosin but without changing the actin. There are other unwanted changes too, like burning your food, or getting your oil hot to the point of decomposing. So you generally want to get your food heated, but frequently there is a limit you don't want to reach. In practical terms, you just have to live with the knowledge that making the temperature lower will make your food take longer until it is cooked. If you make it hotter, it will take shorter, but you risk reaching some unwanted temperature. You also leave less time for flavors to develop, which is important in some cases (e.g. stews) but not in others (e.g. pancakes). Any try to gain some more precision than the above is not practical. The actual relationships are way too complicated. It is theoretically possible to fit a polynomial approximation whose values are much easier to calculate (I think Douglas Baldwin had done it once for a specific cut of meat), but as you don't know the specific parameters to use for each food, it is not a practical proposition even if you keep a calculator in your kitchen. The bottom line: don't cook by time. It is not possible to reliably calculate when food will be done at a given temperature. If a recipe author gives you an approximation, it will be quite imprecise, because it will depend on the shape of your food, the material and thickness of your pan, the temperature deviations of your oven, etc. So you can't even say something like "I know that it takes 30 min at 300 Fahrenheit, I want to know how long it takes at 350 Fahrenheit". It only takes 30 min under very special conditions, which you maybe unknowingly replicate every time you roast, by using the same oven, the same pan, and meat from the same butcher. The good news is that you don't need the above to cook well. Your meat gets done in the oven even if you can't calculate the above. You just have to judge when to take it out, and while time is rather useless for that decision, there are many other, much better, signs for it. A thermometer is the easiest method, and experience will teach you to recognize the perfect doneness also without it, by smell and visible clues like color, texture, amount of vapor, etc. Passing to a higher temperature (and cooking for less time) has the general effect of burning the outside of the meat, and getting the inside not perfectly cooked. Cooking for a longer time has then the effect of better mixing the flavors, and keep some type of meats tender. In specific cases, it's probably possible to use a higher temperature, but simply cooking less is not the only thing that needs to be done; there is something else that needs to be corrected, or something that needs to be done and it was not necessary if you would have cooked at lower temperature. Michael at Herbivoracious pointed out that doubling the temperature does not double the heat. That's part of the problem, but you can correct for it, and you still won't get properly cooked food. Speaking mathematically, 200 degrees of heat for 10 minutes should be the same as 400 degrees of heat for 5, but that's not the case, right? To show that the two are different, all that is needed is a single counter example. Consider the boiling of an egg. If you boil the egg in 105 Fahrenheit (40 Celsius) over an extended period of time, neither the egg yolk nor the egg white will set. If you cook it at, say 160 Fahrenheit (70 Celsius) you will eventually get a hard boiled egg. The egg white and egg yolk consists of proteins. When proteins are heated to a certain temperature, the proteins will denature. In the case of the egg the chemical reaction (denaturization) will simply not be activated at lower temperatures. more simply put if you bake something at 400 degrees it is gonna cook faster on the outside so it will be getting over cooked outside and under cooked inside if you cook at a lower temperature it will cook more evenly and if you bring the item your cooking (if it were meat or something cold) to room temperature before cooking it, it will cook more evenly and faster too. Not the answer you're looking for? Browse other questions tagged temperature cooking-time faq or ask your own question. How long should I cook a steak to make it medium rare? My new pan has a max temperature of 350 F but the recipe calls for 425 F. What should I do? How long should I cook a 10lb chuck roast on low in the crock pot? How can I prevent pork from becoming tough while being held at warm temperature? If braised meat is cooked at 200 degrees in a perfectly sealed pouch in the oven, does the temperature rise above boiling? What does “bring to a simmer” mean? How do I adjust cooking time when temperature may be off by 5-10C? How to determine whether oven thermometer is accurate? Why does oil transfer heat to food more gradually than water?